File Your Income Tax on a Postcard! I think I’m in love already! It’s simpler and takes power from the IRS. Be sure to see my Tax Reform Videos (Categories in the right side panel) to raise your tax reform IQ! Good or bad for the housing market and buyers? To capture $2Billion or more a year in taxes on income that goes unreported by contractors or small businesses and those in the ‘shadow economy’ (working for cash), this little gem was inserted into the Health-care bill before it passed in March. KEEP IN MIND, IT HAS NOTHING TO DO WITH HOSPITALS, DOCTORS, DRUGS OR YOUR HEALTH. It’s all about the money government can grab. It’s just part of the Health-care debacle. And it was inserted by those wizards of the Senate Finance Committee to help offset the cost of Health-care bill, the very one that was supposed to reap us so much in savings by doing away with fraud, duplication, misuse and abuse so prevalent in health care (and every other government run program) before they saved us. This simple little provision starting in 2012 requires companies to report to the IRS all payments of more than $600 a year paid to any vendor. Imagine the paperwork. Businesses already file 1099s for freelancers and others not incorporated, but this expands it even more. Let’s see what that might include; cell phone service, gas for company vehicles, new computer purchases, package pick-up and delivery services and the list goes on and on. This is a good reason to learn more about and support the Fair Tax which will abolish the IRS and get rid of a whole slew of other taxes that decimate your paycheck every two weeks. I’m talking Medicare, payroll taxes, income taxes and any other withholding tax separating you from your money. CAUTION: Don’t be a dreamer now, we’ll still have to pay taxes otherwise how do roads and bridges get built and necessary services get funded? But there is a better way that will unfetter businesses, large and small from being the tax ogre for the federal government. One last thing I love about the Fair Tax is instead of them always picking on those of us who do pay federal taxes (a shrinking pool I might add), the Fair Tax widens the tax base tremendously because federal taxes would be paid only one time for the final end user at the retail level. Therefore everyone who buys anything would become federal taxpayers; criminals, those now working for cash and foreign visitors. Now before you think I’m inhumane, mean and cruel they have figured out a method in the Fair Tax system of compensating the elderly, poor and lesser advantaged. Please, check it out at FAIRTAX.org. This amazed me when I read it. “Just three years ago, Apple wasn’t in the mobile-phone business”. And now they literally cannot make those iSuckers fast enough to supply GLOBAL (ye-gads I hate that word and here I am using it!@*%$!) demand. What will happen to Apple’s innovative spirit, know-how and willingness the keep jammin’ the way they have been as free enterprise is stifled more and more by the regulations, taxes and the over reaching arm of the federal government? There’s a case to be made for why more and more businesses and corporations head overseas drawn by cheaper labor, offshore financial centers and lower taxes. The Tax Cuts of 2001 & 2003 for investors (like almost everyone with an IRA, 401K plan or a pension), small business owners and families will expire. Personal income tax rates will rise for everyone in the 10% or higher bracket. The child tax credit will be cut from $1000 to $500/child. The standard deduction for a married couple reverts to the single level. 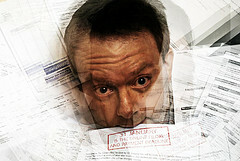 The Death Tax returns which mean dying may very likely pass along a death tax bill to loved ones. Pre-tax dollar Health Savings Accounts go away. Small business expensing will disappear replaced by depreciating expenses over a longer period. So if you think any of these will affect you but you don’t consider yourself rich, you’re right. If you think any of these will affect businesses like Apple and the many much smaller businesses that are the backbone of our economy, or their employees or customers, bingo. You’re right again! But at some point it doesn’t feel so great to be right any more. In fact, it feels sorta crappy to be lied to – again. And do yourself a favor, educate yourself on H.R. 25 and S. 25 or go FAIRTAX.org to learn more.